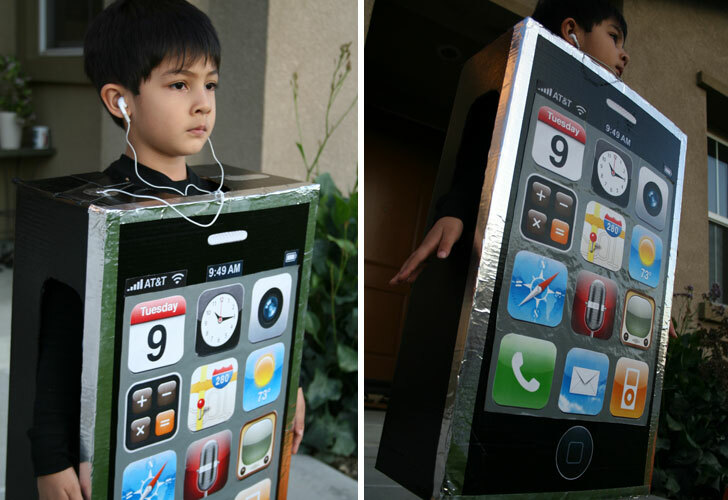 Jewelle Khan and her husband created the clever <a href="http://www.inhabitots.com/greenhalloweencontest/iphone-costume-created-from-recycled-cardboard/">iPhone costume</a> for their son last Halloween using a recycled cardboard box, some paint, sticky aluminum foil, and of course some printed pictures of the famous iPhone apps! 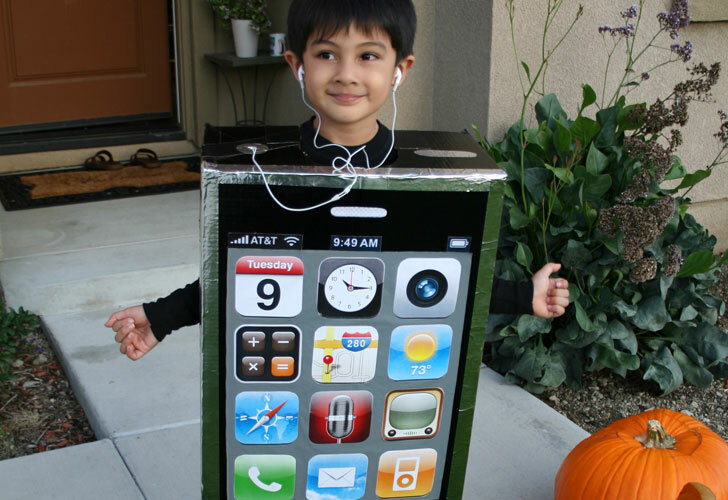 The couple had a lot of fun making the costume, and not surprisingly, their son loved it and got tons of compliments! 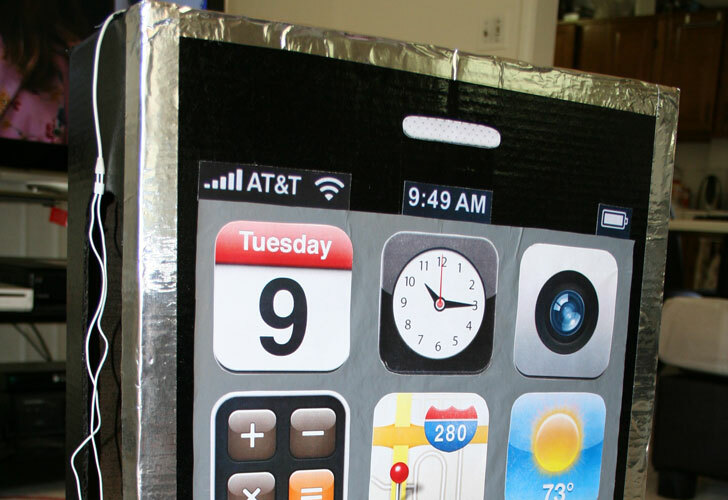 The cardboard box iPhone costume was a finalist in the <a href="http://www.inhabitots.com/greenhalloweencontest/">2010 Inhabitots Green Halloween Costume Contest</a>. Read on to see how to make your own. <h2>Step 1: Start with a Cardboard Box</h2> Start with an old box and stand it up lengthwise. Cut a neck hole in the top and cut the bottom out for where your child's legs will go. Next, cut out big sections of the sides for arm holes with plenty of mobility. Finally, cut a small hole on the top so that you can fit the classic white Apple headphones through. <h2>Step 2: Paint the Box</h2> Spray paint the whole box black. <h2>Step 3: Make the Apps</h2> For the apps and all the graphics used, do image searches on the web. Select ones you like, increase their size using photo editing software and print them. , Then, cut each one out and glue them to the box. <h2>Step 4: Add Sparkle</h2> For the edges, glue on strips of aluminum foil to achieve that shiny metal look. 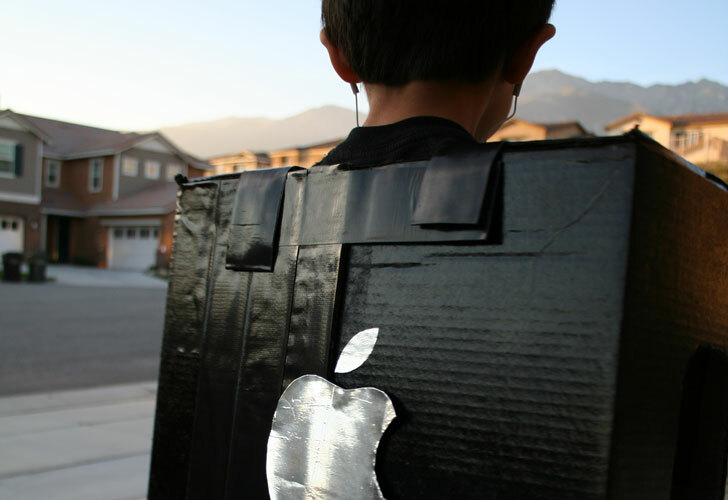 Also, cover the Apple logo in foil and stick it on the back. <h2>Step 5: Dress Your Kid</h2> "You kind of have to experiment with how you are going to put the costume on and off depending on the size of the box and how it fits your child," Jewelle told us. They left the back flaps loose and used velcro so that their son could easily get in and out of the costume without pulling the whole thing over his head. You'll also want to make sure your child can walk in it easily. The Khans cut a big part of the back off because we their son's legs were always hitting the back when he walked. "There should always be adults around helping the child walk and see where he is going because since it's just a big box, it's not that easy to maneuver and we had to assist our son when going up steps, etc.," says Jewelle. 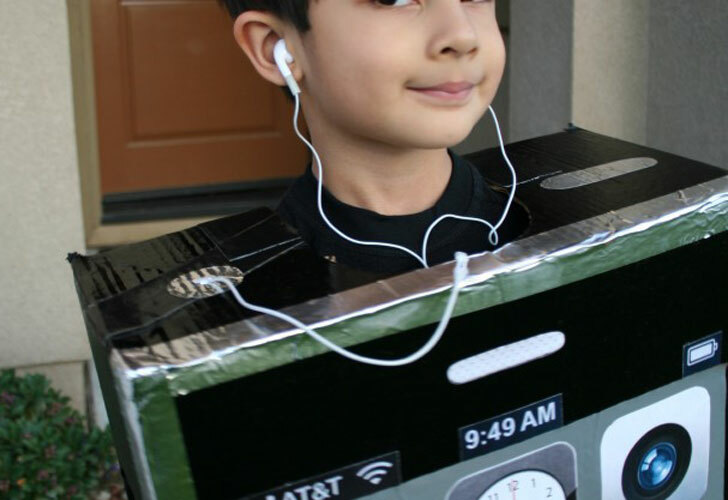 Jewelle Khan and her husband created the clever iPhone costume for their son last Halloween using a recycled cardboard box, some paint, sticky aluminum foil, and of course some printed pictures of the famous iPhone apps! The couple had a lot of fun making the costume, and not surprisingly, their son loved it and got tons of compliments! 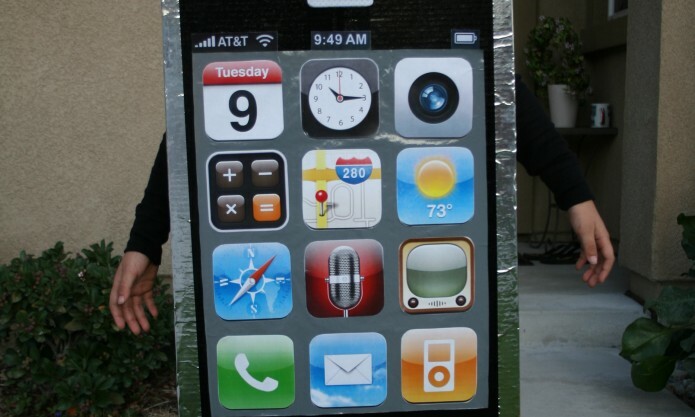 The cardboard box iPhone costume was a finalist in the 2010 Inhabitots Green Halloween Costume Contest. Read on to see how to make your own.